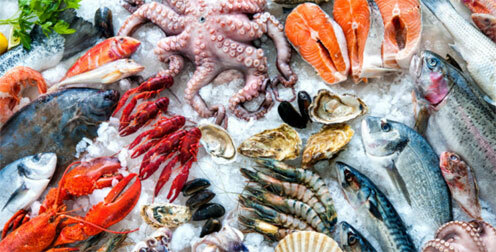 Once again Lisbon receives a festival dedicated entirely to fish and sea-food based cuisine. 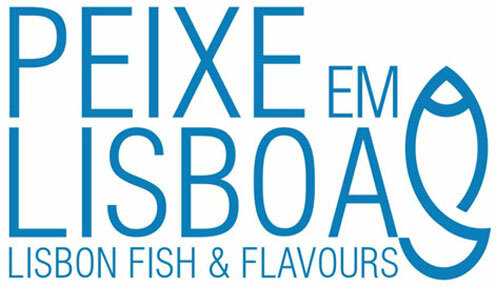 The 2018 edition of Peixe em Lisboa, meaning ‘Fish in Lisbon’ event will take place between 5 and 15 of April. In English the event is marketed under the label of ‘Lisbon Fish & Flavours’. The excellent quality and variety of fish and sea food, widely available in the country bathed by the Atlantic is appreciated not only by the growing numbers of tourists in Portugal, but also by the Portuguese themselves. It is said that there are 365 recipes (one for each day of the week) for cod fish, or bacalhau, dishes alone. A trip to the fish section of any supermarket or, even better, a fish market, shows clearly the importance of fish for the Portuguese. Lisbon Fish & Flavours, one of the most important gastronomy events in Portugal celebrates not only the product – fish and sea food itself, but also the art of cooking it as well as consuming. A lot of attention is given at the festival to wine, an element enhancing any good meal. The ‘fish festival’, taking place during two consecutive weekends, consists of a variety of events, amongst them cooking shows, gourmet food and wine tasting, workshops, contests for the best dishes and lectures from the invited speakers and experts in the culinary art. The best Lisbon region restaurants display their signature dishes – all fish and seafood-based, which makes Peixe em Lisboa and excellent occasion to get familiarized with the city’s culinary treasures. Although Portuguese is the work language of the event, Lisbon Fish & Flavours attracts a lot of attention also from foreign tourists. Since every year there are more and more world class chefs participating in the festival, many of the cooking shows and lectures are held in English. Amongst international chefs to participate in Lisbon Fish & Flavours 2018 edition are: Ashley Palmer-Watts from the London Dinner, Slovenian Ana Ros, chosen in 2016 the World’s Best Female Chef, Iván Dominguéz from the Alborada restaurant in the Spanish Coruna and Andrew Wong representing another iconic London restaurant, A Wong. Portugal is represented by chefs José Avillez, João Oliveira, Tiago Bonito; Henrique Sá Pessoa and João Rodrigues, amongst others. 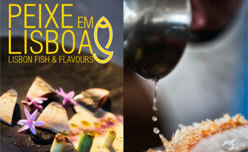 More information on Lisbon Fish & Flavours oficial website (available in Portuguese only). The 2018 edition of the festival will take place, for the second consecutive year, in Carlos Lopes exposition pavilion, located in Eduardo VII Park in the very city centre. Built in 1932 with the purpose of hosting expositions and similar events, the pavilion fell into disuse for many decades. Recently restored to its former glory, the building offers excellent conditions, ample space with seating for 500 people and elegant interiors with the characteristic blue-and-white tile panels, typical to the Portuguese interior decoration and architecture. 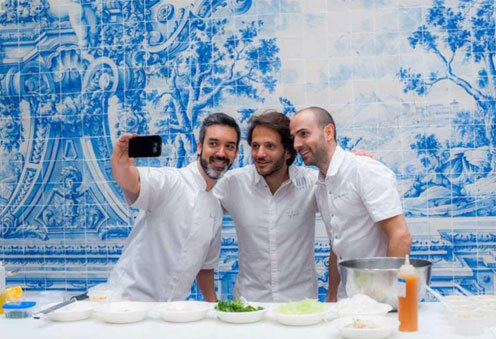 One of the most renown Portuguese chefs, Henrique Sá Pessoa (on the left) during the last year edition of Peixe em Lisboa. In the past, Lisbon Fish & Flavour vents were held in Páteo da Galé venue located by one of the most important downtown Lisbon squares, Terreiro do Paço, which could hardly cater, however, for the constantly growing public of the event. The inauguration of the festival will take place on 5 of April, Thursday, at 6 pm. The majority of Peixe em Lisboa events are programmed for the two following weekends, between noon and 1 am. The cost of daily ticket is 15 euros. Groups of 5 may benefit from a discounted rate of 60 euros for a group ticket. Children under 12 enter free of charge. It is worth noting that a variety of entertainment, contests, workshops and other activities, as well as a play area were prepare for the youngest guests of the event.